This is a case report on an unusual presentation of desmoplastic fibroma of bone. We feel that this presentation should be documented and reviewed in comparison to the available literature, as this tumor is seldom documented in the foot. We review the differential diagnosis, pertinent imagine findings, and surgical management of this pathology. Desmoplastic fibroma of bone is a benign, locally aggressive tumor with varied recurrence rates found in the literature. 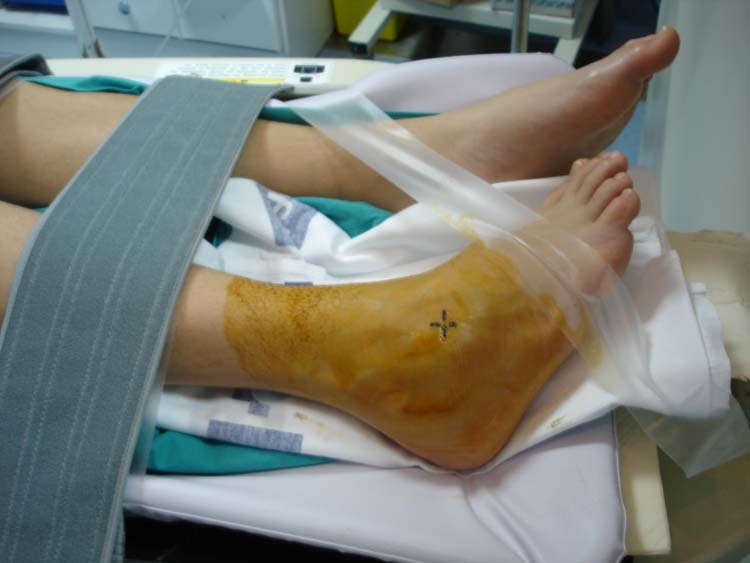 Desmoplastic fibroma of bone, when found in the foot, is an exceedingly rare occurrence . Jaffe first described it as a benign tumor characterized by the formation of abundant collagen fibers by the tumor cells. The tissue is described as being poorly cellular with nuclei that are ovoid or elongated. The incidence of whole-body desmoplastic fibroma is less than 0.1% [1,2]. The most common presenting symptom is pain and/or swelling, although pathologic fracture has been described previously as a common reason for seeking treatment. This tumor has also presented as an incidental finding . The most common differential diagnosis radiographically is fibrosarcoma, however a wide variety of entities can masquerade as a desmoplastic fibroma including fibrous dysplasia, giant cell tumor, unicameral bone cyst, chondromyxoid fibroma, nonossifying fibroma, periosteal desmoids, eosinophilic granuloma, low-grade intraosseous osteosarcoma, adamantinoma, as well as distant metastasis [1-4]. This tumor has been described in patients ranging from 15 months to 75 years of age, and it is most commonly seen in the mandible, femur, pelvis, radius, and tibia . Roentgenograms typically reveal an oval, long axis oriented lytic, expansile lesion with a lucent matrix. The cortex of the involved bone appears thinned and may be violated in more advanced cases [2-4] (Figures 1,2). MRI features include inhomogeneous low signal intensity on T1 weighted images and mixed signal intensity on T2 weighted images. Post-contrast T1 images show irregular, non-enhancing areas incased within an enhanced mass. The areas of low signal intensity on T2 and post-contrast T1 correlate with abundant collagen fibers. The high signal intensity areas on T2 and post-contrast T1 were correlated with fibroblasts and loose collagen fibers [5,6]. 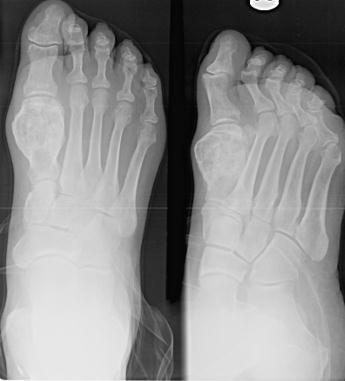 A 75-year-old male patient presents with the complaint of pain in the first metatarsal region. He states he had been having pain, which has been getting progressively worse for the past several months. 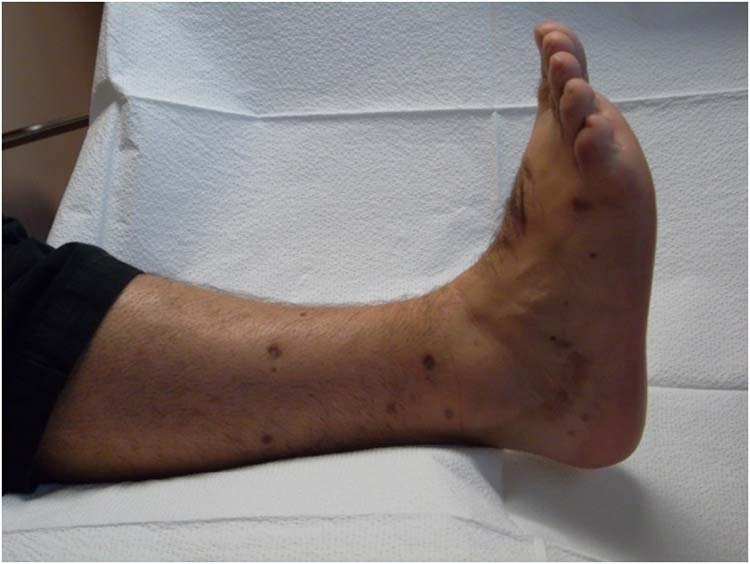 On physical exam, there was edema in the right first ray region extending to the proximal foot and into the right leg. There was exquisite pain to palpation dorsally along the entire course of the first metatarsal. 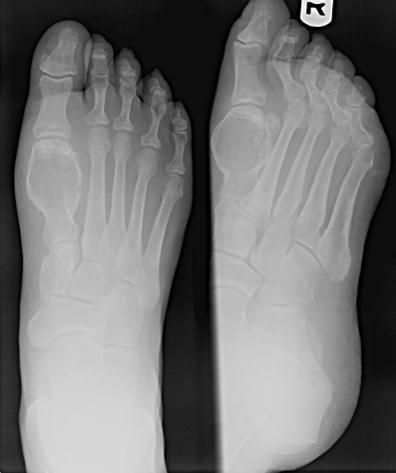 Figure 1 Lateral Pre-op x-ray of desmoplastic fibroma. Figure 2 AP/MO standard radiographic views pre-operatively. Figure 3 Intraoperative view of resected tumor through cortical window. A visible deformity and limited, painful range of motion of the 1st MTPJ was noted. 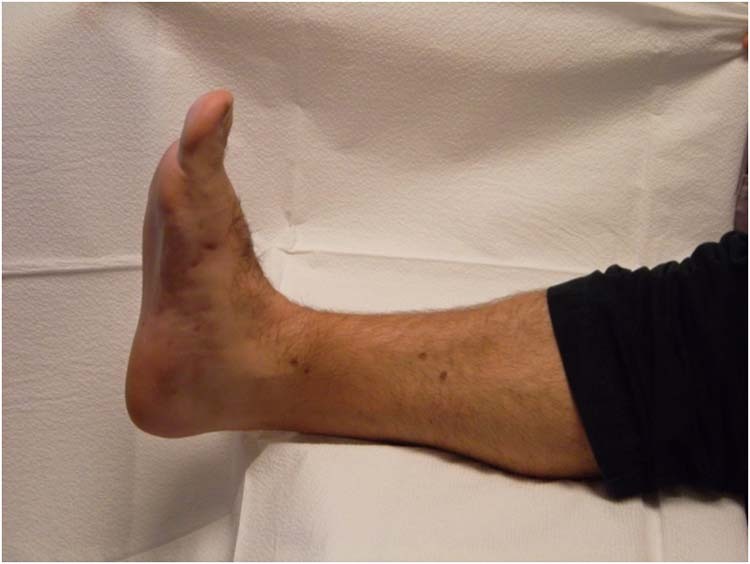 Clinical examination was consistent with hallux abductovalgus with associated dorsal exostosis. Radiographs displayed an expansile, lytic lesion at the distal diaphysis extending in to the metaphysis/epiphysis. MRI showed a small cortical break in the distal segment of the lesion. Our main concern at the time of discovery was aggressiveness of this lesion. Bone scan and chest x-ray revealed no other lesions in the body. At this point, biopsy was elected to determine the nature and aggressiveness of the lesion. 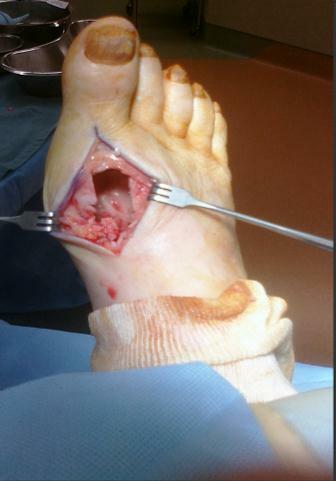 Intraoperatively, a linear incision was made along the first metatarsal and deepened to the deep fascial layer where a capsular-periosteal incision was made. There was gross deformity of the first metatarsal head as well as deformity extending to the midshaft of the aforementioned bone. The specimen measured 1.5 cm X 1.2 cm X 0.3 cm. 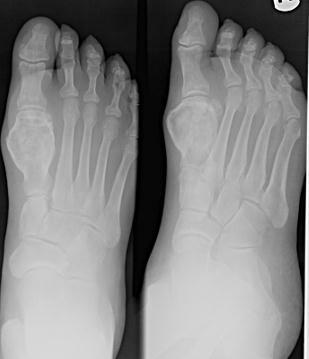 The most proximal aspect of the first metatarsal base was the only unaffected portion of the bone. The mass was removed by excising a rectangular window with the tumor housed inside. The tumor was very soft and, upon removal, it was made certain to excise normal margins on all sides of the tumor (Figure 3). The mass was sent to the pathologist intraoperatively where it was confirmed a benign mass. At this point, the remaining void was curetted to ensure adequate removal of tumor, flushed, and finally packed with a mixture of putty and cancellous bone chips. The dorsal cortical window was replaced and the wound was closed in layers. The pathology report returned with the diagnosis of desmoplastic fibroma. The characteristics of this particular tumor were a bland spindle cell appearance and lack of woven bone formation. The lesion was, however, negative for beta-catenin. At 14 days post-operatively, the patient’s incision site was well coapted and sutures were removed. 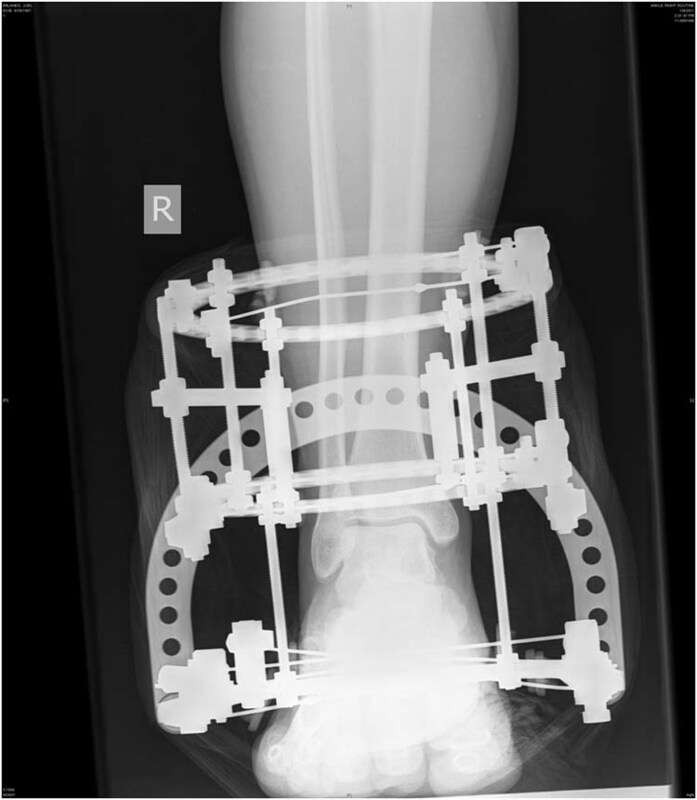 At 4 months post-operatively, the patient’s graft site was fully consolidated, and at 10 months post-operatively the patient was walking with no pain. Radiographs did not display any signs of recurrence (Figures 4,5,6). At 22 months, the patient has not experienced any recurrent symptoms and radiographs have not shown any recurrence. Figure 4 Radiographs at 2 weeks post-operatively. Figure 5 Radiographs 10 months post-operative showing consolidation. Figure 6 Radiographs 10 months post-operative showing consolidation. Desmoplastic fibroma of bone, although considered benign, can be a debilitating condition leading to loss of limb [1-7]. Pathologic elements of this tumor include fibroblasts, collagen fibers, and elongated nuclei. These tumors begin inside the medullary canal and expand outward at which time it is possible to breach the cortex and invade adjacent tissues . There have been isolated reports of associated osseous sarcomas arising in the areas of these tumors [4-8]. Bohm et al found a 50% recurrence rate with 25% of those leading to amputation in the extremities. The treatment of choice when confronted with this clinical and x-ray picture is bone biopsy, wide excision, and bone grafting [3,7]. Recurrent lesions can lead to selective amputation. 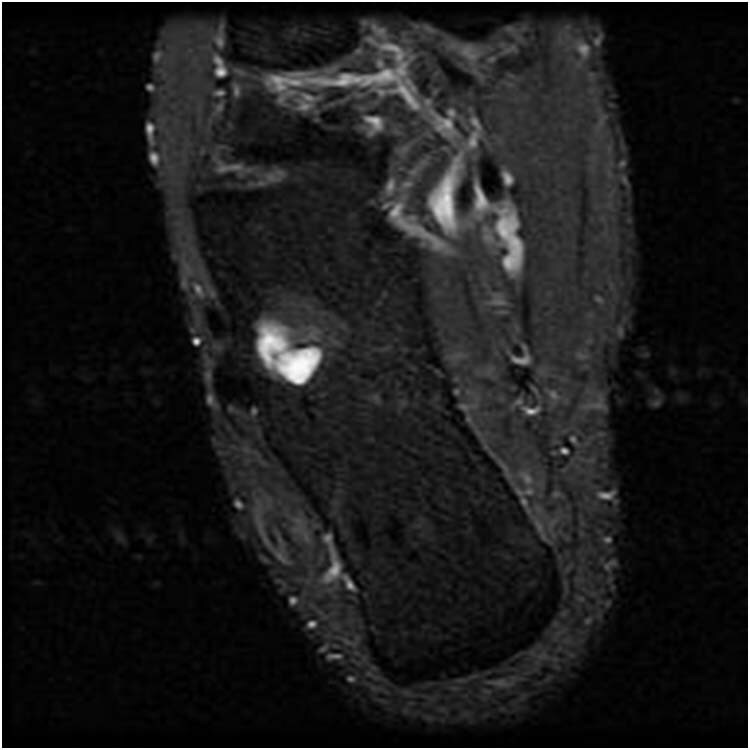 Considering this bone tumor’s relative infrequency, we hope this case report provides guidance in treatment for the foot and ankle surgeon who may be confronted with this entity. The occurrence of osteoid osteomas of the foot is rare and their treatment has usually been surgical. A 13 year-old male with a subchondral osteoid osteoma in the right calcaneus was treated with percutaneous radiofrequency ablation using a simple subtalar approach. Two years later there was no evidence of recurrence and he remains free of pain with normal function. Key words: Osteoid Osteoma, calcaneus, bone tumor. Osteoid osteoma is a small benign osteoblastic tumor which causes localized pain. It accounts for approximately 11% of all benign bone tumors. It usually occurs in children and young adults and most commonly in the cortex of the shaft of long bones. Its treatment has been indicated to lighten the symptomatology and to avoid the possibility of disorders in the nearby growth cartilage, chronic changes of bone remodeling and osteoarthritis, according to the case. 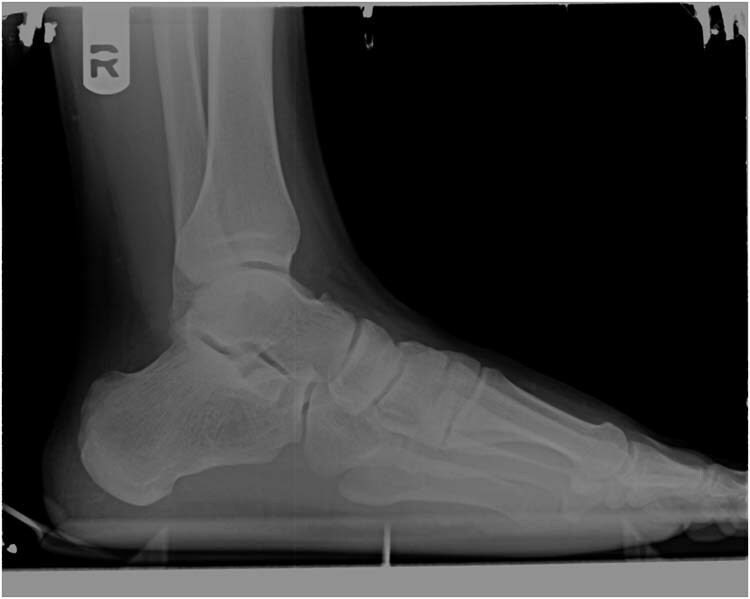 A 13 year-old male presented with an 18-month history of pain and swelling in the right hindfoot and ankle. There was no history of trauma. Initially, the pain was intermittent in the morning. In the final six months, the pain became constant and more severe at night. It was relieved by Ibuprofen. On examination, there was tenderness and swelling around the lateral aspect of the hindfoot. No erythema or heat was present. 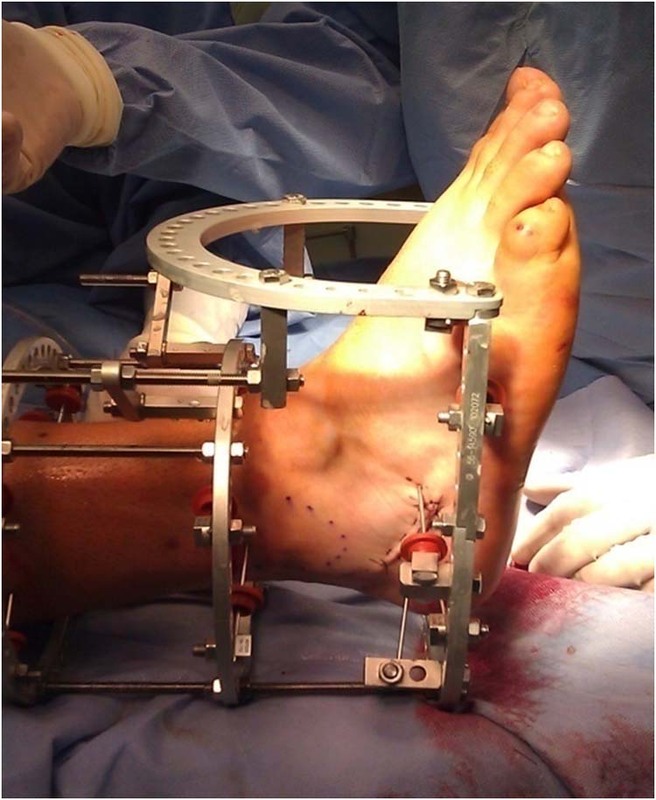 He showed full range of motion of the ankle joint and mild stiffness of the subtalar joint, with mild discomfort at the end of the range of motion. The right calf muscles were atrophied compared with those of the left calf. There were no neurovascular deficits. Laboratory data were normal. 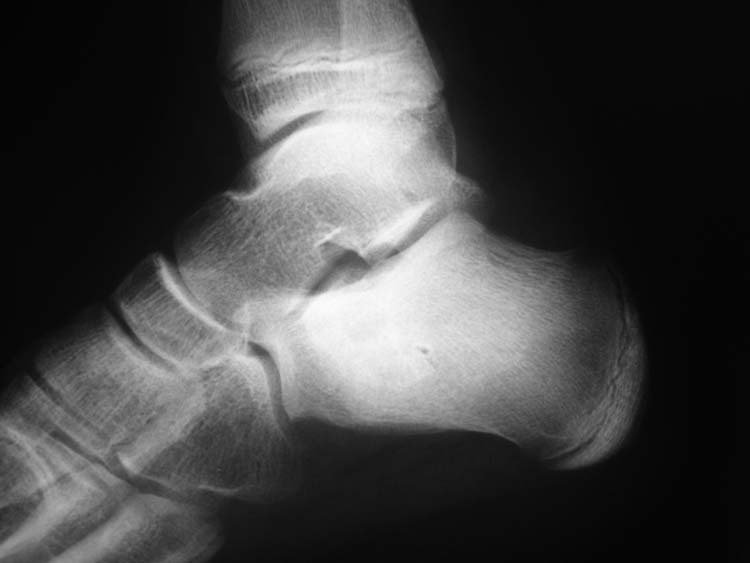 Plain radiographs of the ankle showed a sclerotic area in the calcaneus just below to the subtalar joint. (Fig. 1) Radionuclide bone scan revealed a focal uptake in this area. 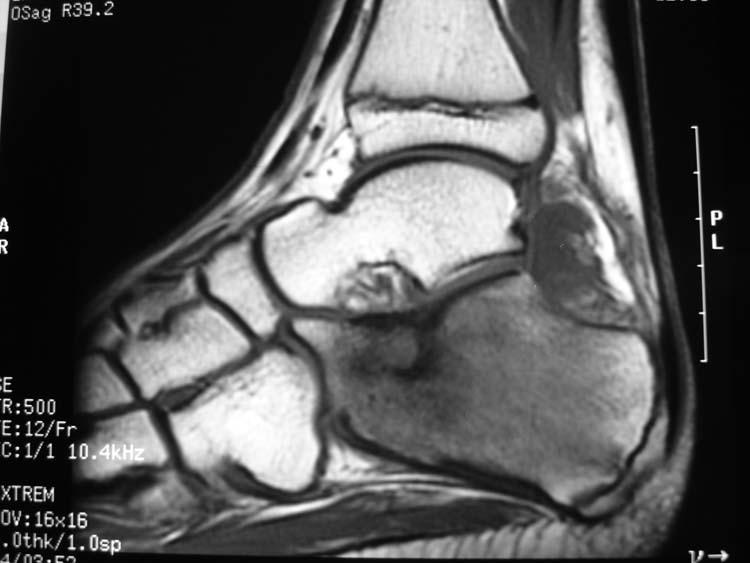 A magnetic resonance image (MRI) showed a well-circumscribed area of low-signal intensity in the anterolateral aspect of the right calcaneus adjacent to the posterior talocalcaneal joint with surrounding edema.(Fig. 2) CT scan confirmed the presence of a small osteolytic lesion with a sclerotic rim in the same place. (Fig. 3) An osteoid osteoma was diagnosed using these data. 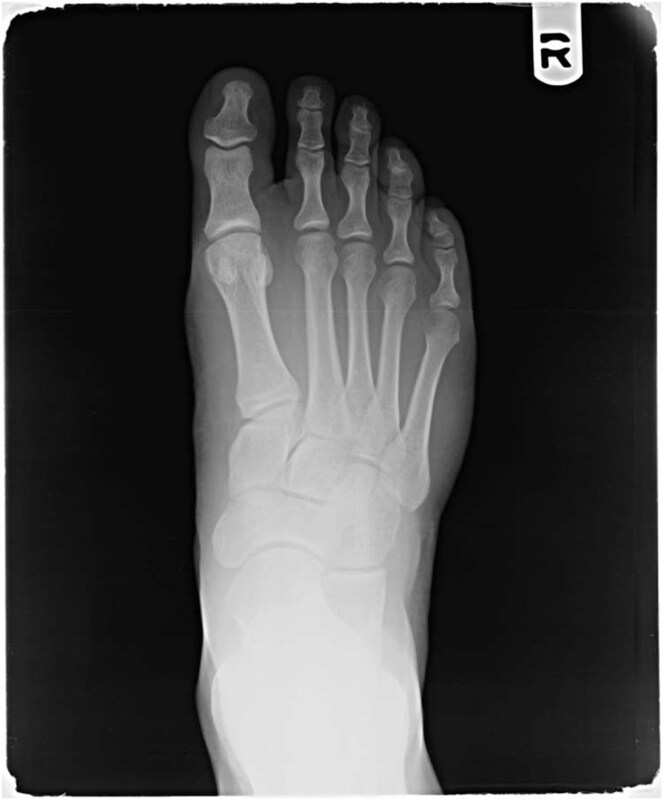 Figure 1 Lateral radiograph of the right foot showing sclerosis at the subchondral area of the calcaneus. 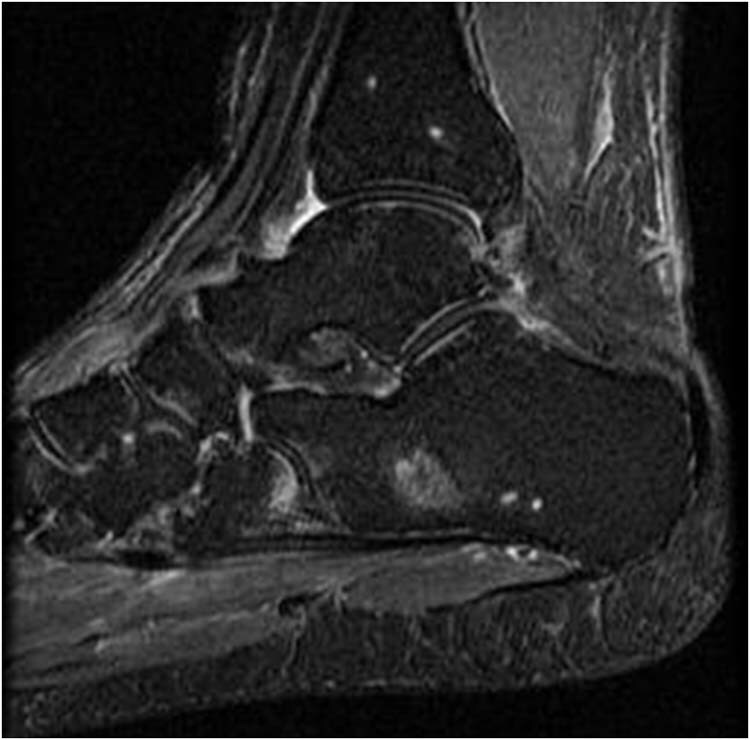 Figure 2 Sagittal T1-weighted MRI shows the nidus as a well-circumscribed area of low-signal intensity in the calcaneus with bone sclerosis and edema in the surrounding bone medulla. 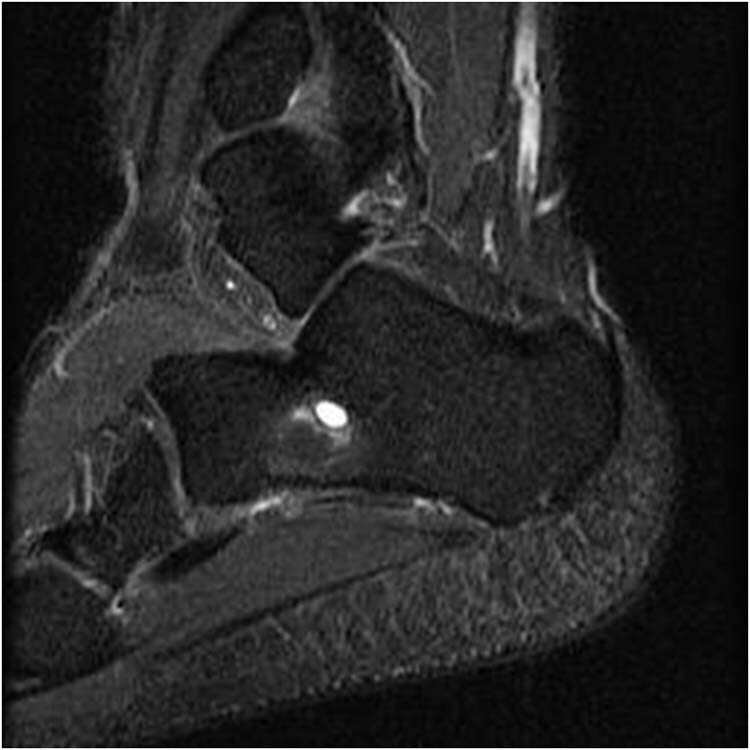 Figure 3 Coronal CT shows the nidus adjacent to the subtalar joint. After a regional anesthetic, the patient was placed on the CT imaging table in a supine position with internal rotation of the leg. (Fig. 4) Under CT guidance, a Kirschner wire with an outer diameter of 1.5 mm was placed in the center of the lesion using a lateral subtalar approach. (Fig. 5) A cannula was placed over the wire; and the wire was replaced through the cannula by a TEW-STC straight electrode (Radionics™, Burlington, Massachusetts). 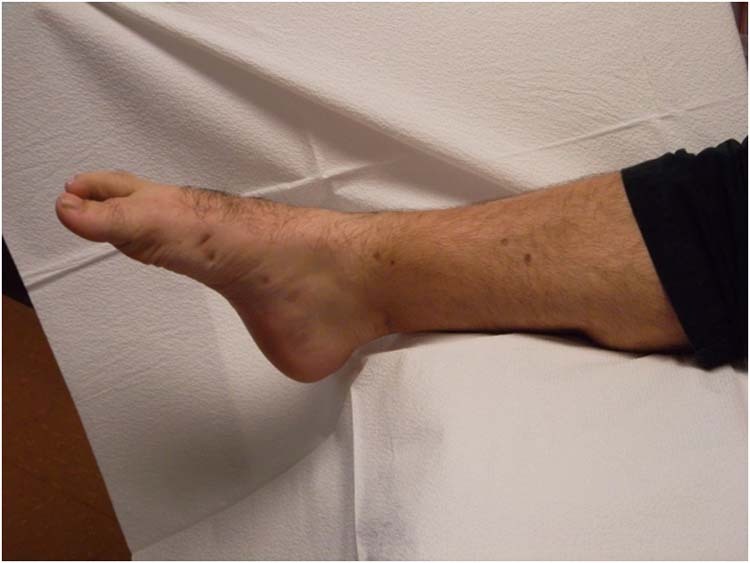 Figure 4 Appearance of the foot, with internal rotation of the leg. The entrance point for the thermoablation has been marked. Figure 5 CT showing the radio-frequency electrode through the cannula in the center of the nidus. The electrode, insulated throughout the length except for the terminal 5 mm, was heated to 90ºC for 6 minutes with a radiofrequency generator (Radionics RFG-3CF). Since the diameter of the nidus was estimated in 12 mm in length, and the thermoablation occurs only in a sphere of tissue approximately 1 cm in diameter, the procedure was repeated changing the electrode a few millimetres to one side. Finally, the electrode and the cannula were removed and the small skin wound was closed with a steristrip. A specimen was not obtained for histology. Without postoperative complications, the patient showed an immediate relief of pain. He was allowed to bear weight immediately after the procedure and he was completely free of pain by the fourth day. At a two year follow-up, there was no evidence of recurrence and the patient remained free of pain with normal activity. 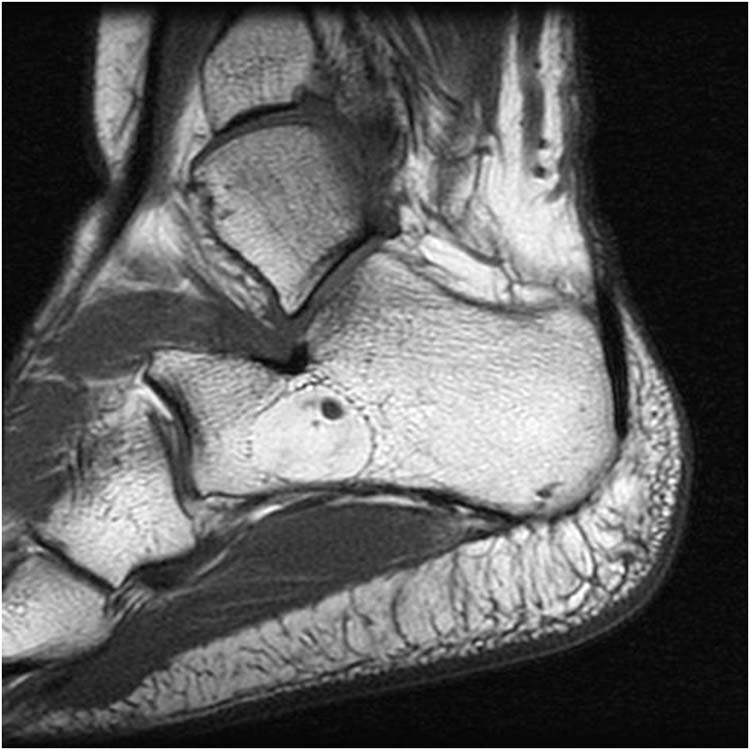 The juxta-articular subchondral location in the calcaneus could explain subtalar arthritis and mistaken or delayed diagnosis. [13,15-17] Finally, a long delay in treatment may lead to muscle atrophies, growth disturbances, persistent joint stiffness or contractures. [12-13] Thinking of the osteoid osteoma in a patient with a typical history of nocturnal pain relieved by NSAID medication, plus the imaging appearance of our case (although different from those of the more common cortical lesions) would be enough for the diagnosis. Although not all authors are of the same opinion , we think that the biopsy is not necessary if there are no clinical or imaging doubts. Even though there are cases of spontaneous healing after years of medical treatment with NSAIDs, surgical removal of the nidus is preferred to achieve rapid symptom relief. However, the nidus is difficult to identify intraoperatively , requiring an excessive amount of bone resection, which may result in weakening of the bony structure and an increased risk of fracture. Moreover, when osteoid osteoma is juxta-articular in location, as in our case, articular surface can be damaged by surgery. Most calcaneal osteoid osteomas reported in literature have been treated with en-bloc resection or curettage, usually packing the calcaneal defect with cancellous bone graft or hydroxyapatite. [11-16,21] A short leg cast was always applied for some weeks postoperatively. Percutaneous radiofrequency ablation requires a small osseous access to allow insertion of the electrode. There is no bone loss and does not cause any significant structural weakening. This is particularly useful in calcaneal lesions, where the effects of the traditional surgery with an easy lateral subtalar approach could be avoided. Percutaneous radiofrequency ablation of the nidus in osteoid osteomas has recently been introduced and offers advantages as compared with traditional open resection. 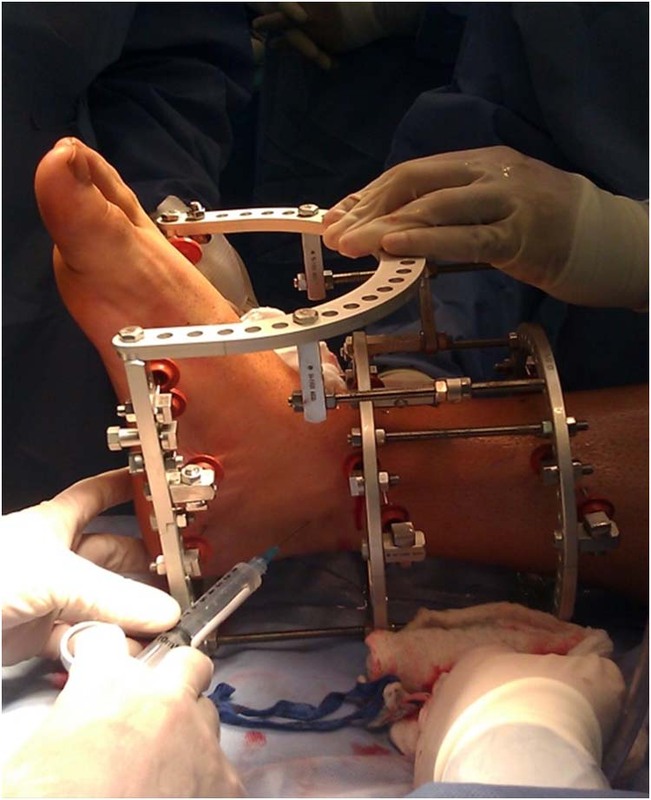 In the calcaneus, the procedure could be performed on an outpatient basis and the patients can immediately resume all daily activities without cast, splints or other external supports. A larger series of calcaneal osteoid osteomas treated with radiofrequency ablation would be necessary to determine safety and efficacy. 1. Campanacci M, Ruggieri P, Gasbarrini A, Ferraro A, Campanacci L. Osteoid osteoma. Direct visual identification and intralesional excision of the nidus with minimal removal of bone. JBJS 81B:814-820, 1999. 2. Bühler M, Binkert C, Exner GU. Osteoid osteoma: technique of computed tomography-controlled percutaneous resection using standard equipment available in most orthopaedic operating rooms. Arch Orthop Trauma Surg 121:458-461, 2001. 3. Bühler M, Exner GU, Hodler J. CT-assisted percutaneous removal of an osteoid osteoma. Orthop Traumatol 3:159-65, 2001. 4. Ward WG, Eckardt JJ, Shayestehfar S, Mirra J, Grogan T, Oppenheim W. Osteoid osteoma diagnosis and management with low morbidity. Clin Orthop 291:229-235, 1993. 5. Cool P, Williams DH, Pullicino V. Interstitial laser photocoagulation for the treatment of osteoid osteoma. JBJS 83B: 1125-1128, 2001. 6. Tillotson CL, Rosenberg AR, Rosenthal DI. Controlled thermal injury of bone. Report of a percutaneous technique using radiofrequency electrode and generator. Invest Radiol 24: 888-892, 1989. 7. Rosenthal DI, Alexander A, Rosenberg AE, Springfield D. Ablation of osteoid osteomas with a percutaneously placed electrode: a new procedure. Radiology 183: 29-33, 1992. 8. Lindner NJ, Ozaki T, Roedl R, Gosheger G, Winkelmann W, Wörtler K. Percutaneous radiofrequency ablation in osteoid osteoma. JBJS 83B: 391-396, 2001. 9. Migues A, Velan O, Solari G, Pace G, Slullitel G, Santini E. Osteoid osteoma of the calcaneus: percutaneous radiofrequency ablation. 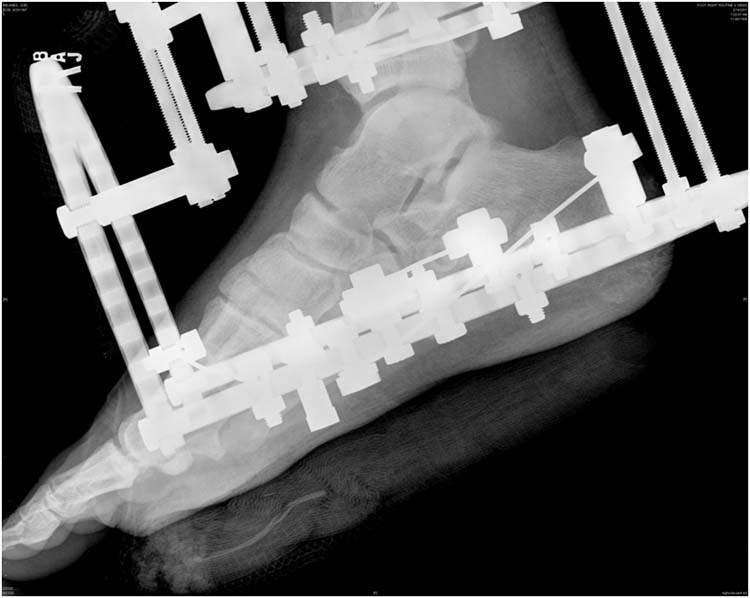 J Foot Ankle Surg 44: 469-472, 2005. 10. De Palma L, Greco F, Coletti V. Osteoid osteoma of the foot. Arch Putti Chir Organi Mov 38: 113-122, 1990. 11.- Birdsall PD. 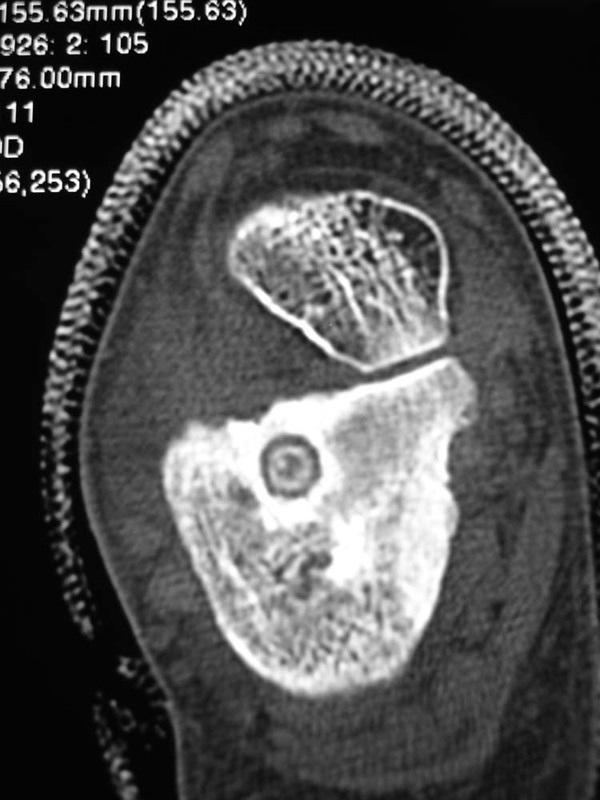 Osteoid osteoma: an unusual cause of foot pain. Orthopedics 24: 173-174, 2001. 12. Christodoulou A, Ploumis A, Karkavelas G, Terzidis I, Tsagias I. 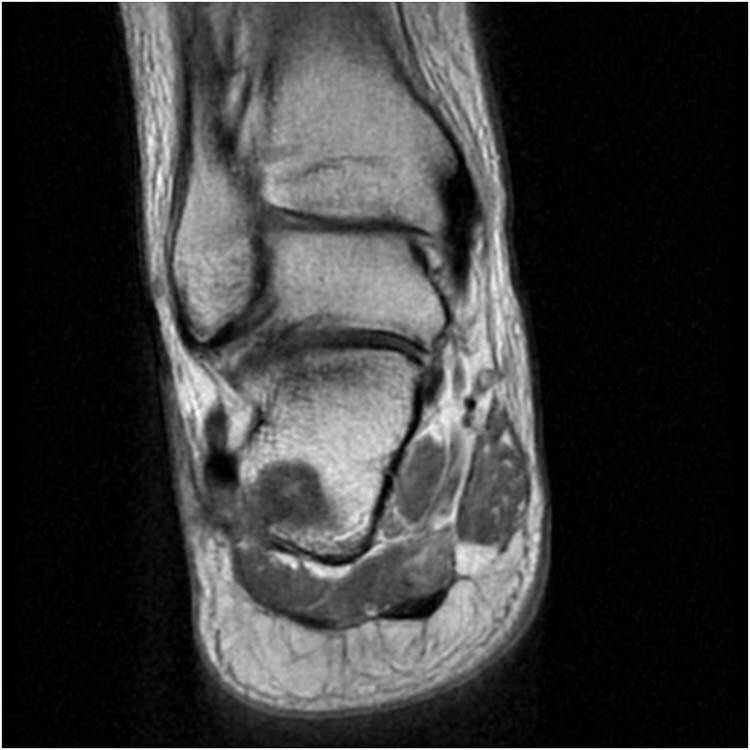 A rare case of juxtaarticular osteoid osteoma of the calcaneus initially misdiagnosed as juvenile chronic arthritis. Arthritis Rheum 48: 776-779, 2003. 13. Okuda R, Kinoshita M, Morikawa J, Jotoku T, Shima H, Abe M. Tibialis spastic varus foot caused by osteoid osteoma of the calcaneus. Clin Orthop 412: 149-152, 2003. 14. Piatkowski S, Warda E. L´ostéome ostéoïde localisé au niveau du calcanéum. Rev Chir Orthop. 59: 609-613, 1973. 15. Sanhudo JAV. 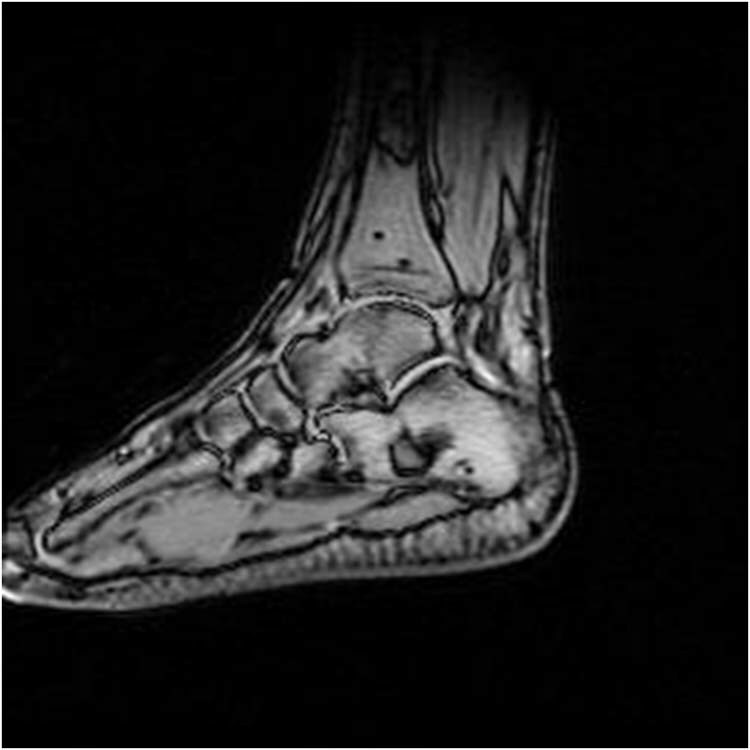 Osteoid osteoma of the calcaneus mimicking os trigonum syndrome: a case report. Foot Ankle Int 27: 548-551, 2006. 16. Morris GB, Goldman FD. 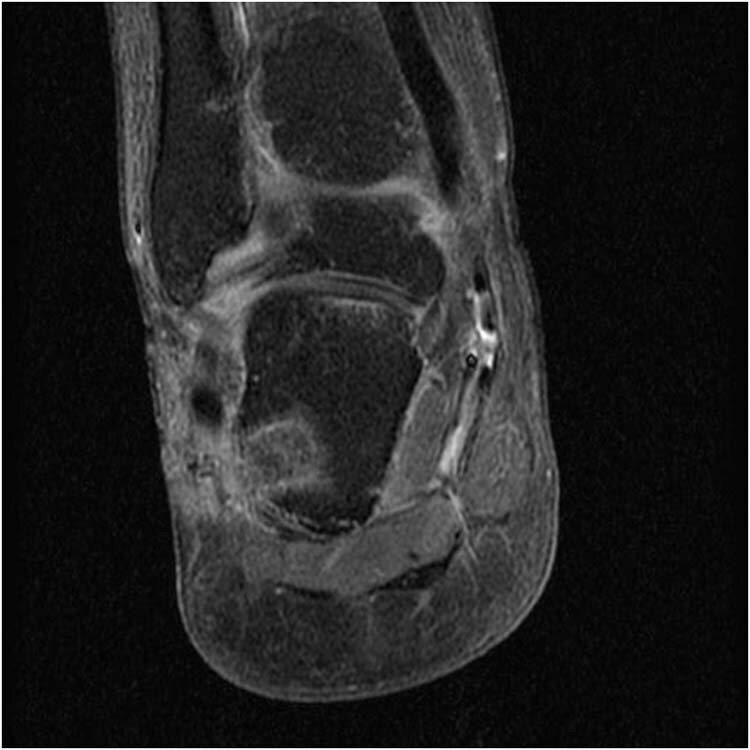 Osteoid osteoma causing subtalar joint arthralgia: a case report. J Foot Ankle Surg. 42: 90-94, 2003. 17. Pikoulas C, Mantzikopoulos G, Thanos L, Passomenos D, Dalamarinis C, Glampedaki-Dagianta K. Unusually located osteoid osteomas. Eur J Radiol. 20: 120-125, 1995. 18. Rosenthal DI, Springfield DS, Gebhardt MC, Rosenberg, AE, Mankin HJ. Osteoid osteoma: percutaneous radio-frequency ablation. Radiology 197: 451-454, 1995. 19. Rosenthal DI, Hornicek FJ, Torriani M, Gebhardt MC, Mankin, HJ. Osteoid osteoma: percutaneous treatment with radiofrequency energy. Radiology 229: 171-175, 2003. 20. 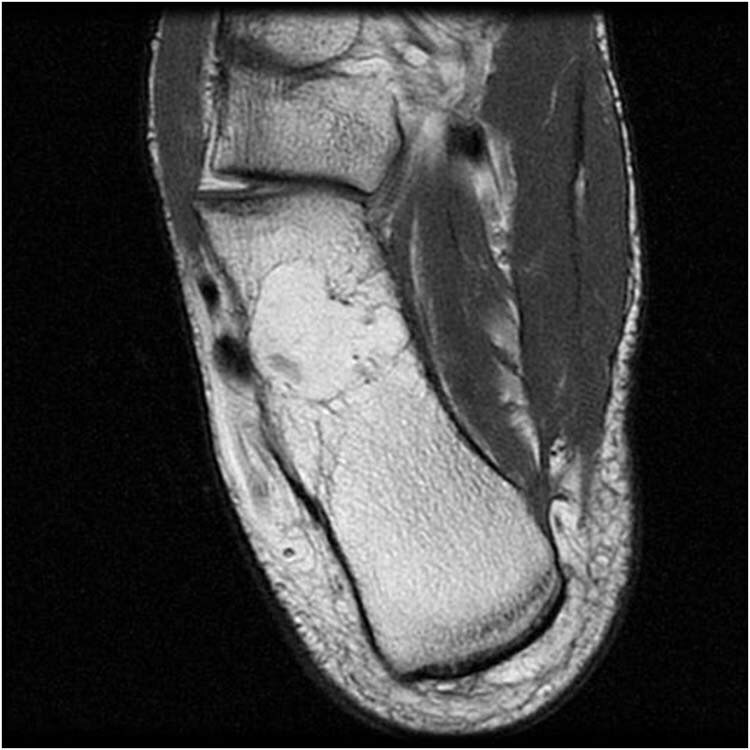 Rossi T, Levitsky K. Osteoid osteoma of the calcaneus: an unusual cause of hindfoot pain in an adolescent athlete. J Athl Train. 31: 71-73, 1996. 21. Khurana JS, Mayo-Smith W, Kattapuram SV. Subtalar arthralgia caused by juxtaarticular osteoid osteoma. Clin Orthop 252: 205-208, 1990. 22. Ghanem I. The management of osteoid osteoma: updates and controversies. Curr Opin Pediatr 18: 36-41, 2006. 23. Rosenthal, DI. Radiofrequency treatment. 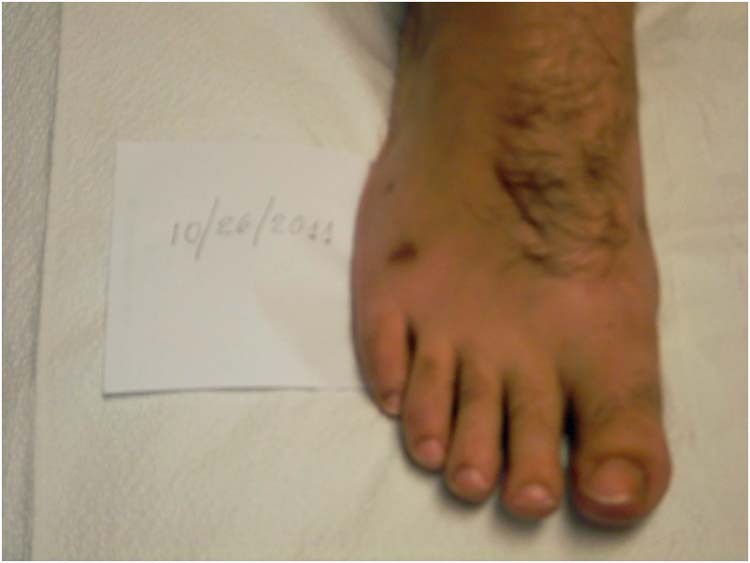 Orthop Clin North Am 37: 475-484, 2006. 24. Finstein JL, Hosalkar HS, Ogilvie CM, Lackman RD. An unusual complication of radiofrequency ablation treatment of osteoid osteoma. Clin Orthop 448: 248-251, 2006. 25. Mastrantuono D, Martorano D, Verna V, Manzini A, Faletti C. L´osteoma osteoide. Nostra esperienza nel trattamento mediante radiofrequenza (RF). Radiol Med 109: 220-228, 2005. 26. Ghanem I, Collet LM, Kharrat K, Samaha E, Deramon H, Mertl P, Dagher F. Percutaneous radiofrequency coagulation of osteoid osteoma in children and adolescents. J Pediatr Orthop 12B: 244-252, 2003. 27.Lindner NJ, Ozaki T, Roedl R, Gosheger G, Winkelmann W, Wortler K. Percutaneous radiofrequency ablation in osteoid osteoma. JBJS 83B: 391-396, 2001. 1 Head of Orthopedic Surgery Department, at the University Hospital of León (Spain). 2 Assistant Doctor. Department of Radiology. University Hospital of Salamanca. Spain. 3 Assistant Doctor. Department of Orthopaedic Surgery. University Hospital of León. Spain. 4 Assistant Doctor. Department of Radiology. University Hospital of Salamanca. Spain. 5 Assistant Doctor. Department of Orthopedic Surgery. University Hospital of León. Spain.